I have a question about the foils that you and Laura use. Can they be used on paper? I remember years ago there was a foil that you could use in your printer. For example, you could print out a picture, put the foil on top of the picture (foil side down) and run it through the printer again. When it came out, you pull the foil sheet off and wherever the toner and the foil met, the foil would be left behind. (Don’t know if I’m explaining this very well.) 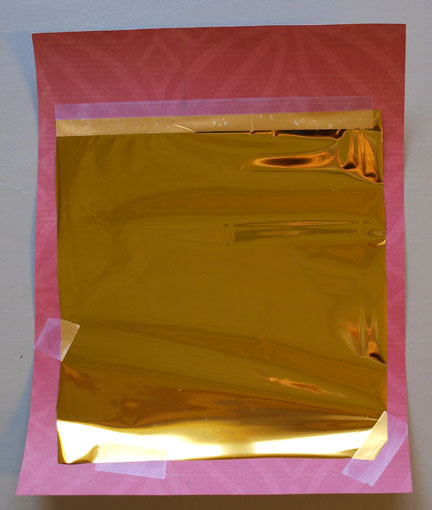 But anyway, do you and/or Laura think her foils could be used in this way? I have been looking for foil to do this process for months! Thanks for your help. PS – I love, love, love your website and the paint sticks! What a good question! As I thought about Terrie’s question, I looked at the printers in my office. I have a color printer in my office, but it’s ink-jet. Foil is applied with heat, so that wasn’t going to help. But, we have a black & white laser printer in Leanne’s office. Laser printers use heat to bond the toner to paper, so this one had possibilities. In case I’ve lost you already, here’s what I was thinking… A laser printer uses heat to bond toner to paper — it essentially “melts” the toner as the paper is fed through the printer. 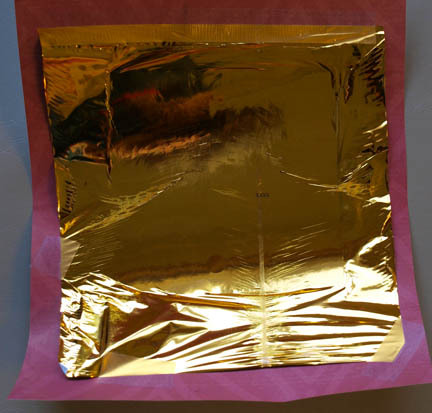 If you tape a piece of foil over the printed image and send it back through the printer, it would get heated up again — and perhaps the hot toner would act like hot glue, giving the foil something to stick to. At least that was my theory. Here’s a quickie tutorial. I’m just thrilled that this works. 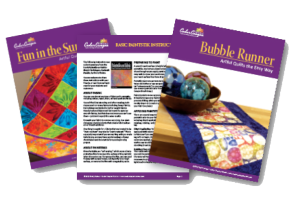 I love learning to do one more thing with materials I already have! An image that you want to add to your paper. I used an image from one of my Doodles Rubbing Plates — they were handy on my computer desktop and I thought it would make a pretty cool image on paper. Any image (including text) should work just fine. Cut a piece of foil larger than the printed area on the paper. Tape all the way across the top to make sure the foil does not come loose in the printer. I secured the lower corners and tried to make sure the foil would not wrinkle as it fed through the printer. Step 3: Send the paper through the printer again. I wanted to send the paper through the printer again, but I didn’t want to print the entire image again. I created a dummy document with a just a couple of characters. I made sure the characters would print on the foil, not on the paper. When the paper came out, I was relieved to see that foil came with it, AND that the foil appeared to stick to the toner. So far, so good! Here’s the fun part! I peeled the foil off the paper and found a wonderful shiny image! It works! This was a really quick experiment. (I had to get this done before I hopped on my flight to San Antonio.) But I learned a few things that I want to share. 1. 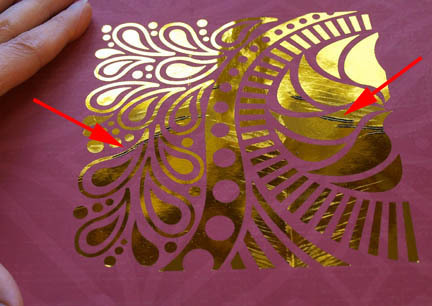 The foil has to be large enough that you’re not putting tape over part of the printed image when you secure the foil to the paper. My guess is that the tape blocks the heat enough to keep the foil from sticking to the toner. 2. 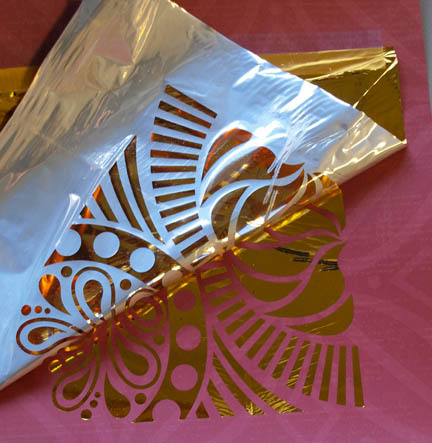 The foil won’t adhere correctly where it wrinkles as it goes through the printer. (see the red arrows in the photo) I’m not sure if it would be best to just tape along the top and not on the sides or bottom — or to tape all the way around. And since we are working with heat-sensitive stuff, maybe we could use an iron to stick foil to the exposed toner? If you play with this and find the answer, let me know! 3. 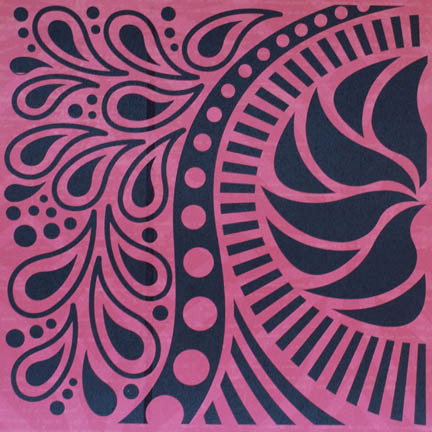 Before you ask, I have no idea if this would work on fabric, but it begs a similar experiment. All said and done, I think this is a wonderful OUTRAGEOUS IDEA and I’m so glad Terrie asked her question. I know for a fact that I NEVER would have even thought about this idea had she not brought it up. The next time you have a question (or an outrageous idea), send it in! Your friends in the Cedar Canyon Community will love to hear about it.